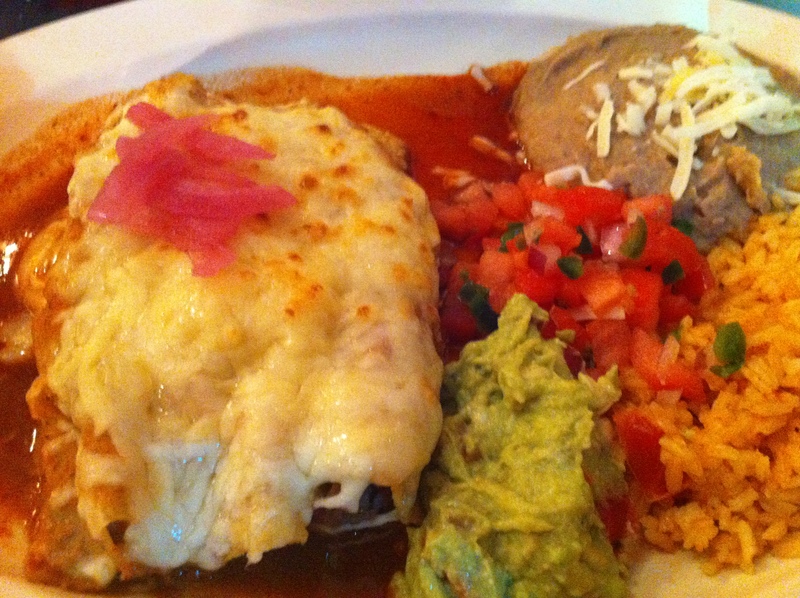 I am crazy about Mexican food–I could eat it every day. 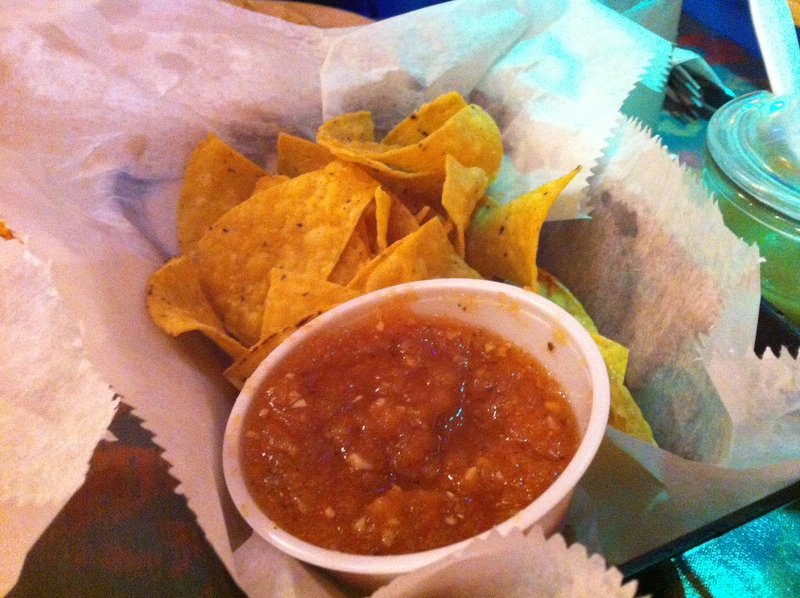 Chips and salsa would be one the foods I would want with me if I were stranded on a desert island. 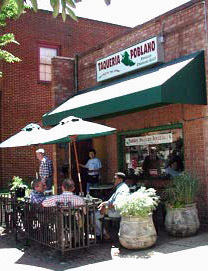 About a year ago, I discovered an excellent little place in the Del Ray neighborhood: Taqueria el Poblano. It’s a very small restaurant and when you walk in, you are usually greeted by the same server, whose name I unfortunately don’t know, he will take your name and tell you the wait time. I am always impressed with how well he manages this chaos. The restaurant is so packed you can barely navigate through it and this man is doing double duty as crowd control and waiter. But he is so effective at his job that you never actually feel chaotic, and looking around at the restaurant full of happy people and young families I can tell I am not the only one who is feeling relaxed by the staff’s efficiency and good attitude. The decor isn’t anything to be celebrated. It’s simple–the tables have vinyl tablecloths and the walls are painted with shades of warm orange and yellow. If the patio outside is open, sit there. Del Ray is a really interesting place for people watching. Upon being seated, the first thing you will be given is a small basket of fresh corn chips and salsa. The chips are very flavorful–I’m not sure what they are frying them in, but they are good enough to eat alone. The salsa is, unfortunately, just okay. I love salsa for the bright flavors of tomato, cilantro and lime. This salsa lacks that brightness. It is obviously very fresh and I do enjoy it, but the salsa is not why I come here. In addition I have noticed that the flavors of the salsa can be inconsistent–on some visits the amount of garlic in the mixture was staggering and on others the color of the salsa was just, well, dull. If you really want to sit and snack on the chips and a dip, I suggest ordering the tangy guacamole. This has all of the brightness that the salsa lacks–there is a distinct tartness of lime and a generous sprinkling of cilantro. The avocado is mashed to a perfect smooth, slightly chunky texture. While snacking on the chips, you must order a margarita. Their house made sour mix is excellent. Be aware though that if you are used to sugary, sweet mixes at other places, you aren’t going to get that here. 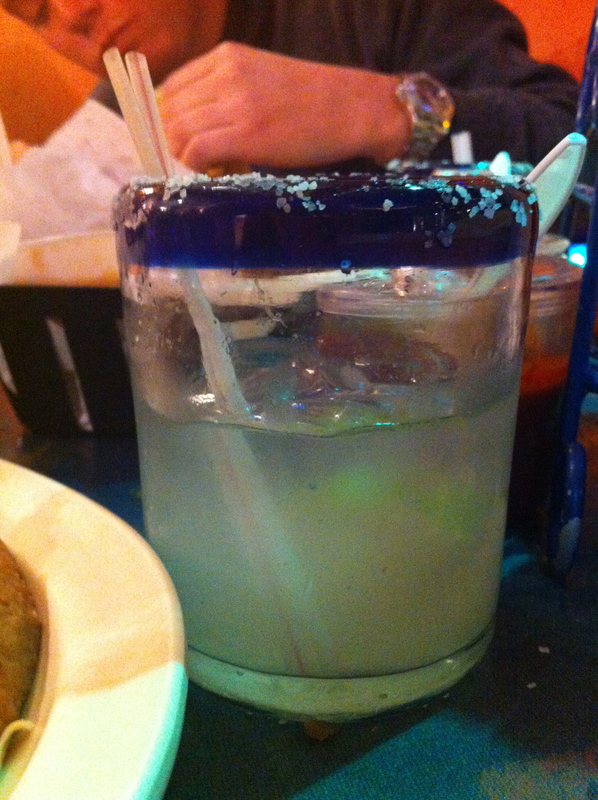 This margarita is tart, and it is perfect along with the richer foods. You can also buy the margarita mix to go and recreate the experience at home. If alcohol isn’t your thing, try the fresh squeezed lime cooler. It is also very tart, but comes with a little shaker of simple syrup for you to add as much (or as little) sweetness as you would like. As for the main course, I have tried many different things here and they are always excellent. Make sure to check out the board in the front hallway for specials. Recently they had lobster tacos with cilantro-lime coleslaw. My standard go-to is the tres enchiladas. With this meal you receive 3 enchiladas with pork, chicken and beef. All slow-cooked and pulled with the perfect seasoning. Each meat is distinct, there is no guessing if you’re currently eating pork or chicken–the meats are cooked exactly right and that makes all the difference. The enchiladas are all covered in the same red sauce which is unlike any other enchilada sauce I’ve had. This one is slightly smoky and there is a note of cinnamon–which seems odd at first but quickly proves “crave-able.” Finally, it is topped with some pickled red onion, and this is my favorite touch. The acid of the onion pairs so well with the rich meats and cheese. In addition there is a scoop of guacamole and an excellent pico de gallo. Even the sides are done right here. The refried beans and rice that we all usually just send right back into the kitchen uneaten are given special treatment. The beans are especially good, though I can’t pinpoint exactly what the flavors are (which drives me crazy). Though they are vegetarian, there is a robust meaty quality to them and they are just the right smooth texture. Other good options include the Crispy LA Taco which comes in a fresh, made just for you, taco shell. It crumbles apart and can be messy, but only in the best way. The tostada is wonderfully fresh and HUGE. For 12.95 you end up with a massive plate of food that can easily be shared. The tacos al carbon are also all very good, and the rajas poblanos (the peppers for which the restaurant is named) is an excellent mix of creamy, salty cheese, slightly sweet poblano peppers and oregano. You can also get rajas poblanos alone as an appetizer, which would be excellent. Finally there is desert. Now, I usually skip desert but not here. For desert you will need to go off menu. From time to time this desert is actually mentioned on the specials, but even when it isn’t the restaurant can make it for you. Ask for the tequila chocolate ice cream. What arrives at your table is nothing short of extraordinary. It is one scoop of rich, fudge dark chocolate ice cream (in a simple plastic bowl). Over this they pour a little tequila and top it with crunchy sea salt and candied lime zest. The combination of all these flavors will make you close your eyes and moan in pleasure. It’s that good. So next time you are in the Del Ray area, or are just in the mood for some really great Mexican, be sure to check out this small, unassuming place.